Anthony Stephen "Tony" Fauci ( /ˈfaʊtʃi/) (born December 24, 1940) is an American immunologist who has made substantial contributions to HIV/AIDS research and other immunodeficiencies, both as a scientist and as the head of the National Institute of Allergy and Infectious Diseases (NIAID). Anthony Stephen Fauci was born on December 24, 1940, in Brooklyn, New York, to Stephen A. Fauci and Eugenia A. Fauci, who owned a pharmacy in which his father worked as the pharmacist, his mother and sister worked the register, and Fauci delivered prescriptions. He is of Italian descent and grew up Catholic. He graduated from Regis High School in New York City and went on to attend the College of the Holy Cross and received his M.D. from Cornell University Medical College in 1966. He then completed an internship and residency at The New York Hospital-Cornell Medical Center. In 1968, he came to the National Institutes of Health (NIH) as a clinical associate in the Laboratory of Clinical Investigation (LCI) in NIAID. In 1974, he became Head of the Clinical Physiology Section, LCI, and in 1980 was appointed Chief of the Laboratory of Immunoregulation, a position he still holds. In 1984, he became Director of NIAID, which has the responsibility for an extensive research portfolio of basic and applied research on infectious and immune-mediated illnesses. He played a significant role in the early 2000s in creating the President's Emergency Plan for AIDS Relief and in driving development of biodefense drugs and vaccines following the 9/11 terrorist attacks. Fauci has made a number of basic scientific observations that contribute to the current understanding of the regulation of the human immune response, and is recognized for delineating the mechanisms whereby immunosuppressive agents adapt to the human immune response. He has developed therapies for formerly fatal diseases such as polyarteritis nodosa, granulomatosis with polyangiitis, and lymphomatoid granulomatosis. In a 1985 Stanford University Arthritis Center Survey of the American Rheumatism Association, membership ranked Fauci's work on the treatment of polyarteritis nodosa and granulomatosis with polyangiitis as one of the most important advances in patient management in rheumatology over the previous 20 years. Fauci has made influential contributions to the understanding of how HIV destroys the body's defenses leading to the progression to AIDS. He also has outlined the mechanisms of induction of HIV expression by endogenous cytokines. Fauci has played an important role in developing strategies for the therapy and immune reconstitution of patients with this disease, as well as for a vaccine to prevent HIV infection. His current research is concentrated on identifying the nature of the immunopathogenic mechanisms of HIV infection and the scope of the body's immune responses to HIV. In 2003, the Institute for Scientific Information indicated that Fauci was the 13th most-cited scientist during the twenty-year period from 1983 to 2002. He was the ninth most-cited scientist in immunology in the period January 1993 to June 30, 2003. Fauci is a member of the National Academy of Sciences, the American Academy of Arts and Sciences, the Institute of Medicine (Council Member), the American Philosophical Society, and the Royal Danish Academy of Sciences and Letters, as well as other numerous professional societies including the American Society for Clinical Investigation, the Infectious Diseases Society of America, and the American Association of Immunologists. He serves on the editorial boards of many scientific journals; as an editor of Harrison's Principles of Internal Medicine; and as author, coauthor, or editor of more than 1,000 scientific publications, including several textbooks. 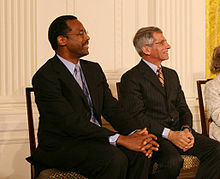 Ben Carson and Anthony Fauci (right) being announced as a recipients of the Presidential Medal of Freedom at the White House on June 19, 2008. Fauci has been a visiting professor at many medical centers, and has received 30 honorary doctorate degrees from universities in the United States and abroad. On October 16, 2014, in a United States Congressional hearing regarding the Ebola virus crisis, Dr. Fauci, who has been speaking on the issue, regarding "screening" for weeks, and as the director of the National Institute of Allergy and Infectious Diseases (NIAID), testified and warned that they were still some distance from producing sufficient quantities for widespread trials. "While NIAID is an active participant in the global effort to address the public health emergency occurring in west Africa, it is important to recognize that we are still in the early stages of understanding how infection with the Ebola virus can be treated and prevented," Fauci said. Dr. Fauci also remarked in the hearing: "As we continue to expedite research while enforcing high safety and efficacy standards, the implementation of the public health measures already known to contain prior Ebola virus outbreaks and the implementation of treatment strategies such as fluid and electrolyte replacement are essential to preventing additional infections, treating those already infected, protecting healthcare providers, and ultimately bringing this epidemic to an end." Fauci AS, Dale DC, Balow JE (March 1976). "Glucocorticosteroid therapy: mechanisms of action and clinical considerations". Ann. Intern. Med. 84 (3): 304–15. doi:10.7326/0003-4819-84-3-304. PMID 769625. Fauci AS, Haynes B, Katz P (November 1978). "The spectrum of vasculitis: clinical, pathologic, immunologic and therapeutic considerations". Ann. Intern. Med. 89 (5 Pt 1): 660–76. doi:10.7326/0003-4819-89-5-660. PMID 31121. Fauci AS, Haynes BF, Katz P, Wolff SM (January 1983). "Wegener's granulomatosis: prospective clinical and therapeutic experience with 85 patients for 21 years". Ann. Intern. Med. 98 (1): 76–85. doi:10.7326/0003-4819-98-1-76. PMID 6336643. Fauci AS; Macher AM; Longo DL; et al. (January 1984). "NIH conference. Acquired immunodeficiency syndrome: epidemiologic, clinical, immunologic, and therapeutic considerations". Ann. Intern. Med. 100 (1): 92–106. doi:10.7326/0003-4819-100-1-92. PMID 6318629. Fauci AS (February 1988). "The human immunodeficiency virus: infectivity and mechanisms of pathogenesis". Science. 239 (4840): 617–22. doi:10.1126/science.3277274. PMID 3277274. Pantaleo G, Graziosi C, Fauci AS (Feb 1993). "New concepts in the immunopathogenesis of human immunodeficiency virus infection". N Engl J Med. 328 (5): 327–35. doi:10.1056/NEJM199302043280508. PMID 8093551. Chun TW, Fauci AS (Sep 1999). "Latent reservoirs of HIV: obstacles to the eradication of virus". Proc Natl Acad Sci U S A. 96 (20): 10958–61. doi:10.1073/pnas.96.20.10958. PMC 34225. PMID 10500107. Morens DM, Folkers GK, Fauci AS (Jul 2004). "The challenge of emerging and re-emerging infectious diseases". Nature. 430 (6996): 242–9. doi:10.1038/nature02759. PMID 15241422. Johnston MI, Fauci AS (Aug 2008). "An HIV vaccine--challenges and prospects". N Engl J Med. 359 (9): 888–90. doi:10.1056/NEJMp0806162. PMID 18753644. ^ a b c Gallin, John I. (1 October 2007). "Introduction of Anthony S. Fauci, MD". Journal of Clinical Investigation. 117 (10): 3131–3135. doi:10.1172/jci33692. PMC 1994641. PMID 17909634. ^ "Fauci89: Transcription of oral history interview" (PDF). NIH. March 7, 1989. Archived from the original (PDF) on April 9, 2016. ^ a b "Biography Anthony S. Fauci, M.D. NIAID Director". NIAID. Archived from the original on October 30, 2007. ^ Varmus, Harold (1 December 2013). "Making PEPFAR". Science & Diplomacy. 2 (4). ^ "All Laureates — English". Jung Foundation for Science and Research. Retrieved 4 November 2016. ^ "Anthony S. Fauci, M.D. Biography and Interview". www.achievement.org. American Academy of Achievement. ^ Altman, Lawrence K. (16 September 2007). "4 Winners of Lasker Medical Prize". The New York Times. ^ Officials eyeing additional screening for Ebola in US, vow to protect citizens from disease - Associated Press - 6 October 2014. Retrieved 16 October 2014. ^ a b c Roberts, Dan - News World news Ebola CDC director warns Ebola like 'forest fire' as Congress readies for hearing - Ebola crisis live updates - The Guardian. Retrieved 16 October 2014. Scholia has an author profile for Anthony S. Fauci.